I was at an Open House of my friend's beauty salon (Flaunted Curves Salon) last night. 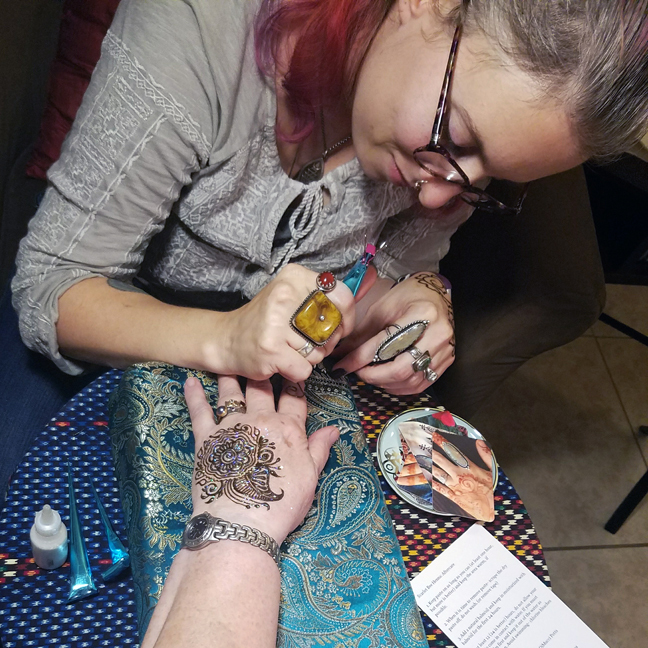 I enjoyed meeting and talking with her friends and other clients, but it was also fun to watch a Henna artist in action. Nicole (AKA Scarlet Bee Henna) was among the vendors/artists who were there to make it a multifaceted event. My friend, Brenda, put her name on the list for a session, and with the artist's permission I took pictures. As Nicole worked she talked about making her own paste, how the recipe changed with different conditions. Humidity and temperature played a part as they could directly affect how the paste behaved. She said she received some from a fellow artist in Nevada, but it just didn't perform well in Central Texas. She talked about the essential oils she used in the recipes – lavender with this batch for its soothing effect. Different oils/scents work for when she's feeling sociable, more introverted, stress or any other feeling that she thinks she and/or her clients might experience. Below are some pictures of Nicole working. Brenda asked if I was going to get henna as well. Nicole added, "I love working on men!" That was all the inspiration I needed. When she called my name... well, when she called my name Brenda jumped in to have Nicole fix the "accident" that happened when she reached into her purse. Then I sat down. Nicole asked what I did, so I told her that I work at the state. We discussed where to put the Henna. She thought the palm of my hand would be best because there's fuzz on the back of my hand and arm. I showed her my simian crease and we discussed that a bit. Then she took her time to imagine the design, and how to incorporate the crease that now called to her since I had pointed it out. Eventually her husband sat down near us and we all talked about archiving, art, writing and all sorts of other things. She is, apparently, a professionally trained photographer doing social media promotion for Austin Community College. He also works for ACC – Associate Professor of Religion and Philosophy, and the Department Chair. After a while she commented, "I thought you were a creative type, but when I asked what you did you said you worked at the state." My answer was that I had to pay the bills somehow, a feeling we all share. This morning I looked at my design. I had slept with it on my hand to help darken it and make it as permanent as possible. (She said it would last around 2 weeks.) I had closed my hand at some point during the night and the design jumped over my simian crease, but I think I did pretty well for a first-timer. TomCat felt that he needed to supervise this photo session going on in my backyard by the morning light. I have kept hand salve on it, which is actually kind of a treat. 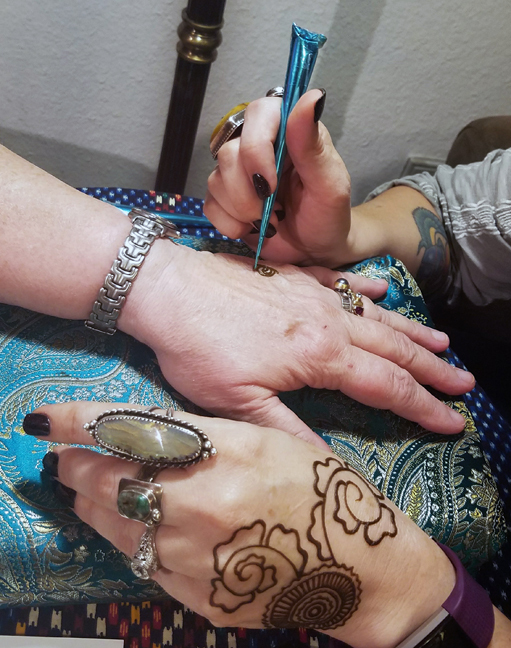 I love my Henna and I'm looking forward to the next session with Nicole. Every party should have a Henna artist, just like parties need a DJ.